It’s easy to overlook Dusseldorf when you have exciting cities like Berlin, but Dusseldorf is a luxurious culinary gem. However, if you are looking for a quick escape with luxury shopping to rival Champs-Elysees in Paris, a German pub-crawl to give Munich a run for its money and an art scene good enough for the Guggenheim – dive headfirst into Düsseldorf and see why ‘The Dorf’ is affectionately addictive for travellers who want it all. Dusseldorf feels relatively new to the gourmet food scene with a handful of fine-dining restaurants to feast your ‘gourmet’ eyes on. Luckily, with a new generation of chefs returning home to open up shop, there are some restaurants to visit outside of the normal German-fare of dumplings and pork hock. Lido Hafen is one of the few fine-dining restaurants located along the Rhine River with excellent views of Media Harbour and perhaps a leader in the movement to bring upscale dining to Dusseldorf. With three restaurants under its name, the Lido Bistro and Lido Malkasten offer varying cuisines with their own style and take on European and Asian classics. For carnivores, you really can not go past MASH. Teethering on the end of a rather gritty pub street, MASH offers meat ( and lots of it) with excellent wine pairings despite being a well-known quasi chain in Europe. Think you can’t get good Japanese food outside of Japan? Think again. Dusseldorf is the third largest Japanese community after London and Paris and with more than 7,000 residents calling Dusseldorf home, the Japanese food is of course…comparable. For ramen, try NaNiWa but be prepared to wait in line for noodles, Yabase is a small but affordable Japanese sushi restaurant and for gourmet Japanese try Nagaya. Dusseldorf offers the old-world European charm found in cities like Vienna with a small cluster of luxury hotels to choose from. Konigsallee Boulevard, affectionately known to locals as KO for short is the Champs-Elysees of Paris in Dusseldorf. A long boulevard of luxury shops encourage tourists to spend big and to do it all in style in a luxury hotel like the Breidenbacher Hof – A Cappella Hotel on the corner of KO. The Rhineland joie de vivre oozes out of this 200-year-old hotel which is celebrating its 10-year anniversary under the Capella Group. From personal assistants to a gourmet feast in its classic restaurant Brasseries 1806, the Breidenbacher Hof offers not only a romantic luxury escape but an in-house clinic for health and vanity checks – apparently all very popular with their uber-rich guests. For those who love to live life in the fast lane – opt for the German Autobahn Experience and try your hand at playing ‘Schumacher’. The World’s Largest Bar is in Dusseldorf – so beer-lovers, what are you waiting for? With more than 300 bars and pubs located within a one-half square mile radius, the longest bar in the world makes Dusseldorf a beer-hub for beer drinkers and pub-lovers. Famous visitors include Napoleon, Goethe and of course German, Heinrich Heine. The neighbourhood Altstadt is home to Alt Beer ( Altbier) in Dusseldorf – a dark brown ale famous to the Dusseldorf region and the only beer you should be drinking in The Dorf. Brauereir Zur Uel, Zum Uerige, Zum Schlussel and Brauerei Fuchschen are all great spots for a true Dusseldorf experience with other beer-loving locals. 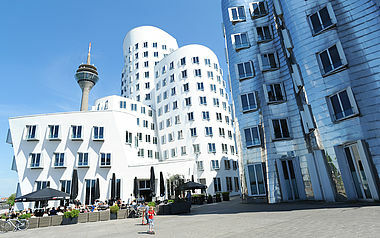 For free art in the city, Dusseldorf offers excellent architecture around the city. Start your art-walk at Media Harbour, a short 20 minute walk from the largest bar in the city centre and witness some weird but architecturally fascinating buildings along the Rhine River. Known as the media hub for art, culture and fashion, the harbour has a mix of restaurants which come alive at night but the artistic constructions by Frank Gehry and David Chipperfield are the highlight of the area. The steel and glass structure open up the skyline with the Kniebrucke road bridge being a popular stop for newly married couples to capture their special moment. For a cool art walk, check out KIT ( Kunst Im Tunnel) – an elliptical gallery underground.